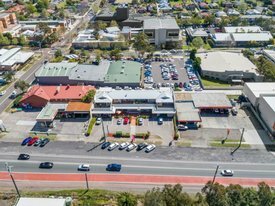 35 Commercial Real Estate & Properties in Wyong are listed in 6 categories. We have 16 Industrial Warehouses Sale , 10 Development LandsSale , 7 Hotels and LeisureSale , 1 OfficesSale , 1 Medical and Consulting PropertiesSale and 1 Retail ShopsSale . Now available to purchase, nearly completed architecturally designed Industrial unit that is almost ready to move into. Located in the heart of North Wyong Industrial Estate. Unit 5 has a floor area of 278sqm, that is constructed of pre cast concrete panel, commercial style glazed entry door, kitchenette, unisex toilet, and high and wide automatic roller door. 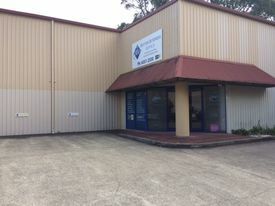 Located in the IN1 General Industrial area of North Wyong. This is a rare and perfect opportunity to purchase your own industrial unit either to move into or as an investment. Lot 2 DP880 644, Approximately 147,700m2 with massive exposure to over 25,000 passing cars per day and town water, power and sewer available to the site, this excellent parcel consists of just over 36 acres of land with split zoning (E3,E2) and represents an amazing opportunity and superior location for many uses including any home based industry. Make time to inspect and don&apos;t miss this once in a lifetime opportunity! Functional Industrial unit located in one of the Central Coast’s fastest growing business locations. Approx. 166 sqm combined floor space that consist of 130 sqm of ground floor space of high clearance warehouse, high & wide roller door, Kitchenette, common off street parking, plus a mezzanine area with an enclosed office area. These opportunities a very rare at present so be quick to secure your next business address or investment. Property Features: Approx. 130 sqm ground floor space. 36 sqm Mezzanine with enclose office area. 1 of 12 units. 3 phase power. Off street parking. Zoned IN1 General Industrial. Earn A Huge 8% Return - Guaranteed $7,900,000 NO GST Applica.. Invest Or Owner Occupy - The Choice Is Yours $320,000 + GST if applica..
178m2 industrial unit with allocated car spaces. Being the front unit in the complex, it offers great street exposure! Zoned IN1 General Industrial. Currently occupied by a business willing to stay but can be sold vacant possession. Quality tilt panel Industrial Unit 144m2 IN1 zoning. Front unit with easy delivery access and exposure to the street. This is by far the best valued established unit on todays market. Hurry it wont last at this price! This property is a rare opportunity to purchase an industrial building on a large block, high power and demountable offices in a tightly held industrial area. Features of the property include: Clear span warehouse with up to 7.1m internal clearance. 3 phase power– providing ample power for high power uses (subject to confirmation from relevant energy provider). Well appointed demountable offices and amenities. Excellent B Double access. Large block – with future growth potential. Currently leased with an annual income of $95,000 per annum. Site area – 7,781sqm approx. Building area – Factory approx. 600sqm and Office approx. 300sqm. Located in heart of North Wyong with access to the M1 via Pacific Highway & Sparks Road. Zoned IN1 General Industrial. This is a rare opportunity which won’t last long. Please contact the Mark Davies to organise an inspection today. Total net lettable area 234sqm including 21sqm ground floor reception and office; 182sqm of high clearance regular shaped warehouse space; 30sqm of first floor partitioned offices and a secure regular shaped external yard area approx 70sqm approx. There is also an existing open storage mezzanine at the rear of the premises. The factory has been freashly painted, has new LED Lighting installed and is insulated. The first floor offices have also been freshly carpeted and painted and a new hot water system installed for the kitchenette. The property does offer plenty of 3 phase power, amenities with shower and on site parking. Don't delay units with yards are hard to find. Available for lease $25,000 per annum net + GST. Now available to purchase, nearly completed architecturally designed Industrial unit that is almost ready to move into. Located in the heart of North Wyong Industrial Estate. Unit 3 has a floor area of 187sqm, that is constructed of pre cast concrete panel, commercial style glazed windows and entry door, kitchenette, unisex toilet, and high and wide automatic roller door. 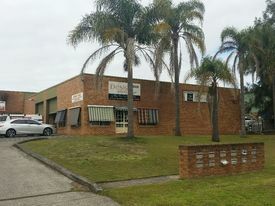 Located in the IN1 General Industrial area of North Wyong, this is a rare and perfect opportunity to purchase your own industrial unit either to move into or as an investment. Now available to purchase, nearly completed architecturally designed Industrial unit that is almost ready to move into. Located in the heart of North Wyong Industrial Estate. Unit 6 has a floor area of 196sqm, that is constructed of pre cast concrete panel, commercial style glazed windows and entry door, kitchenette, unisex toilet, and high and wide automatic roller door. 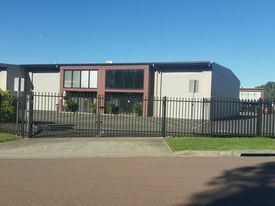 Located in the IN1 General Industrial area of North Wyong. This is a rare and perfect opportunity to purchase your own industrial unit either to move into or as an investment. Occupy And/or Invest – High Exposure Retail Opportunity $899,000 + GST If Applica.. This secure retail investment presents an outstanding opportunity for an astute investor & or an owner occupier/investor alike, to enter the market or expand an existing business, alongside a diversified tenancy mix in a prime Pacific Highway location with easy access to various transport options. Available are 3 shops, all with separate utilities under one title, with 2 shops currently leased. The 3rd, 86sqm shop which is currently vacant, is ideal for multiple uses including retail, medical/consulting, food uses, professional uses and much more. This is the perfect opportunity for that someone who wants to move into their own shopfront and have extra income from the other 2 tenancies. Great established tenancy mix. Potential gross income of $78,763.64 per annum. Zoned B3 Commercial Core. Potential for additional level/s (subject to council approval). 2+2 year Lease term at Shop 112 Pacific Highway. 3+3 year lease term at shop 114 Pacific Highway. Shop 116 currently vacant with potential income of $30,000 per annum. 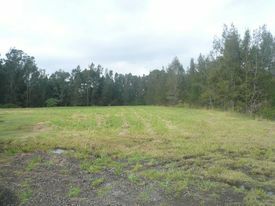 284sqm land area. 226sqm floor area. Excellent Pacific Highway exposure, thousands of traffic movements a day. Functional industrial unit located in one of the Central Coast’s fastest growing business locations. Approx. 200sqm of ground floor space including an air conditioned reception/showroom area high clearance warehouse, automatic high & wide roller door, lunchroom area, common off street parking, plus a mezzanine air conditioned office area. These opportunities a very rare at present so be quick to secure your next business address or investment. 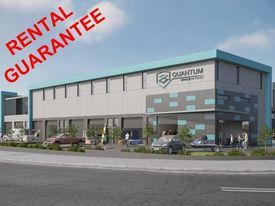 Central Coast’s Hottest New Development – Quantum Space features Warehousing, Micro Commercial and Self Storage units you can own as an investment or for personal or commercial use. Brand new and architecturally designed, Quantum Space Wyong is located in the thriving North Wyong Business area only 2 min from the Pacific Highway. The attractive building features units ranging in size from 30 to 93m2 with up to 3.9m high roller doors. A premium feature in hot demand – drive in access and mezzanine levels for all in one office and workspace solutions. The Quantum Space facility is conveniently located in the Central Coast’s growth corridor, making accessing from home or work easy AND with the area’s population growing at record rates demand has already outstripped supply. State Government Infrastructure planned spending for the Central Coast is over $4billion including the Northconnecx, University, Roads and other upgrades. Dont miss the boom, get in now. 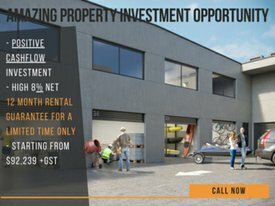 A GREAT INVESTMENT with Key Benefits: 10% net return guaranteed with a 12 month lease back (special off the plan offer on 5 units only) Future capital growth Builder over 30 years experience Affordably lower priced than residential investments (with finance available at 4 5%). Low outgoings compared to other property investments. 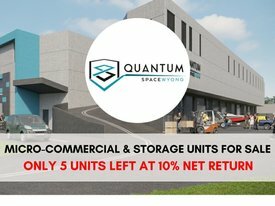 High rental yield, High demand and High Occupancy Rates greater than 98% Most investors only make 1% 2% net PA on residential investments, but with Quantum get 12months at 10% net (5 units only dont miss out). STATE OF THE ART FACILITY Brand new architecturally designed building – attractive to you and your tenants Secure complex with 24/7 camera surveillance Wide and up to 3.9m high roller doors Drive in units Amenities on all levels, ground floor units have amenities in each unit Prime Location only 2mins to the Pacific Highway Completion expected August 2019 If you are looking for a high yield property with huge capital growth potential, we have several packages available: INVEST $100,000 and earn $10,000 net with our 10% return bonus offer, INVEST $300,000 and earn $30,000 net with our 10% return bonus offer, INVEST $500,000 earn $50,000 net with our 10% return bonus offer, Or individual units available from $92k + gst to suite your budget. Perfect for Self Managed Super Funds, Retirees, or Prudent investors, don’t miss out on this opportunity with a 12 month lease back at 10% net return (5 UNITS ONLY). Don’t miss out on this amazing offer. Contact Bernie at LJHooker Commercial today on 0434 177 114 for more info on this fantastic opportunity! 9 Small Commercial/industrial lot land subdivision with areas available from 803sqm up to 1189sqm, Zoned B6 Enterprise Corridor. Suitable for a wide variety of uses! Ideal uses including light industrial, bulky goods, office, shop top housing (subject to Council consent). This is the perfect opportunity to secure a development site in the North Wyong/Wadalba Enterprise Precinct at an affordable price tag! This land is also strategically located within convenient distance to the M1 Pacific Motorway and major centres of the Central Coast. Surrounded by established quality businesses. Wyong Milk Factory has charm and history and is home to unique businesses including All Sorts Fitness & Wellbeing Centre, Little Creek Cheese Factory, Coast & Valley Vets and many more. 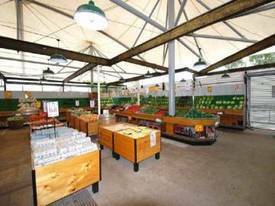 Large 400m2 Fruit & Vegetable Stall with extensive display area with adjustable storage including coolroom. External access for loading bay and internal market hall access for customers. This is a unique tourist destination set on Wyong Creek. Wyong Milk Factory has charm and history and is home to Little Creek Cheese Factory, All Sorts Fitness & Wellbeing Centre, Coast & Valley Vets and many more. This food hall includes tenants like butcher, bakery, woodfire pizza cafe. 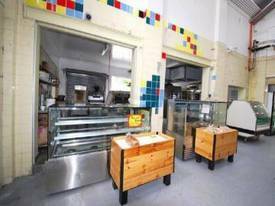 Fitout available for purchase or rentalisation.